This Advent, my mind has been drawn to the doctrine of creation and the place of the Incarnation in the great drama of the cosmos. I am not entirely sure why this is so. Certainly last week I noted Oliver O’Donovan’s statement in On the Thirty-Nine Articles: Conversations with Tudor Christianity that much Reformation theology was weak on the doctrine of creation, and this has had an effect upon the sciences and theology, etc. He wonders what different roads we may have taken if the doctrine of creation had been one of the parts of St Thomas Aquinas we had kept. Anyway, if we think theologically about Christmas, I imagine our thinking is typically something along these lines: Jesus is the Second Person of the Trinity; He took on the form of a slave for our salvation; He became a baby so that He could die for us as a Man. Yet today at church, the sermon closed with some beautiful words of Madeleine L’Engle, pointing towards the pre-Incarnate reality of the Second Person of the Trinity, bringing home the force of what it means that God became man as Jesus. If we do that, we need to realise that something as well as salvation from sin, death, damnation, devil, is going on. The eternal life of God is an extra-temporal reality. God is. God is reality. Or maybe not — maybe God is beyond reality. God has no being because being relies entirely on God. A robust doctrine of God should make the dramatic event of the Incarnation that much more potent. And a robust doctrine of God makes for a robust doctrine of creation — God made everything very good. As the Fathers, including St Augustine, were ever keen to note, all of creation is good by nature. It was created good, even if now it is fallen and tending towards entropy. Creation was made because God willed it. Creation was made to glorify God. God entered into that creation. The timeless creator joined the creation in time. Not simply to save us and make us what Adam was, but to make us what Adam was meant to be. This is the emphasis of St Athanasius, On the Incarnation, as well as of Robert Grosseteste’s work (which is to say, it is not the sole preserve of the Eastern Church). It is a consideration of salvation history primarily as Creation – Incarnation – Paradise, whereas we tend to think in terms of Fall – Crucifixion – Redemption. Both are true, but the former we usually neglect. We usually think of the biblical drama as an arc from Genesis 3 with the Fall to Revelation 21 with the lake of fire. This Christmastide, let’s meditate on the restored creation, on that arc from Genesis 1 with creation to Revelation 22 with the crystal river and lamb upon the throne. There is a famous statement by Pope St John Paul II (or JP2 to his homeys) that the Church must start to breathe with both her lungs once again — that is, East and West. I don’t know the original context of the statement, but it seems to emerge in discussions about the more ‘rational’ approach to the faith in the western tradition and the more ‘mystical’ approach in eastern Christianity. A false dichotomy, to be sure. 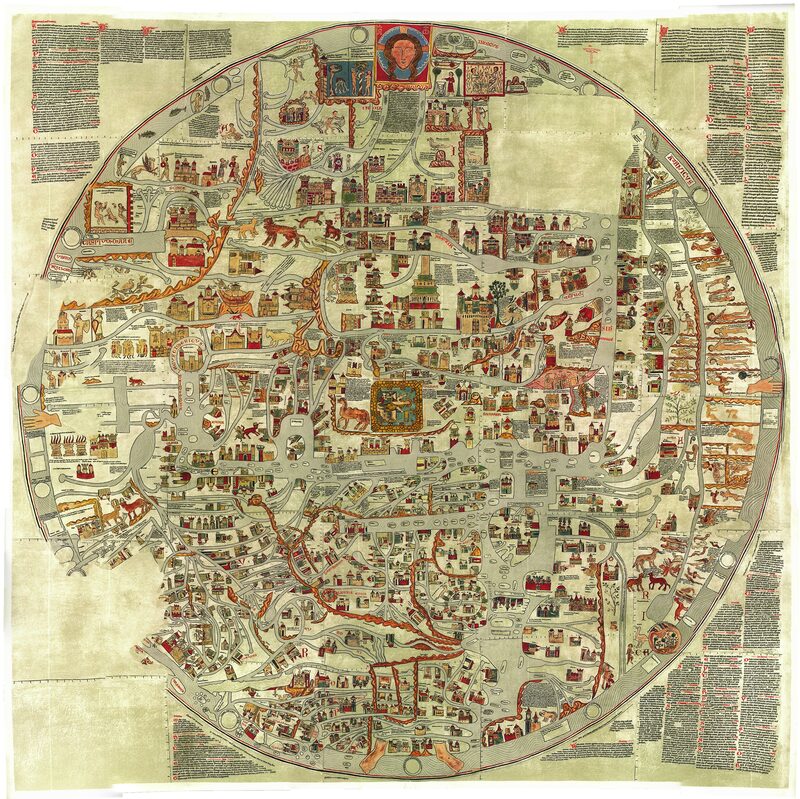 Nonetheless, as the chapter about St John of the Cross in Andrew Louth’s The Origins of the Christian Mystical Tradition shows, there are differences in the approach to mysticism found in East and West. Someone such as Vladimir Lossky would probably boil it down to the differences in our approach to the Most Holy and Undivided Trinity. The problem with Lossky, however, is that the opening chapter of The Mystical Theology of the Eastern Church raises a sharp irreconcilability between the two traditions. He argues that our view of the Trinity is, in fact, false — but does so through a misreading of St Thomas Aquinas and thus the whole of western Trinitarian thought. And here lies my main thought. Yet if you read Latin Trinitarian theology, we often start with the unity of God — thus Anselm’s Monologion and Proslogion. Greek theology, on the other hand, often starts with the three Persons — thus St Gregory of Nyssa’s That There Are Not Three Gods. Lossky argues that our insistence on the divine unity posits a fourth hypostasis in the Trinity, a fourth thing that is the ground of being of the three Persons. However, and I forget the title of the book that brought this home to me (it was about Aquinas and Bonaventure’s triadology), what we really mean by that unity is all three persons at once. The unity is a conceptual articulation, not a substance of its own. Rather than arguing us vs them in Trinitarian theology, East-West dialogue should FIRST acknowledge the incomprehensible and unapproachable mystery here. And then we should see what nuances we can gain from each other. And then, perhaps, we can start to breathe with both our lungs. 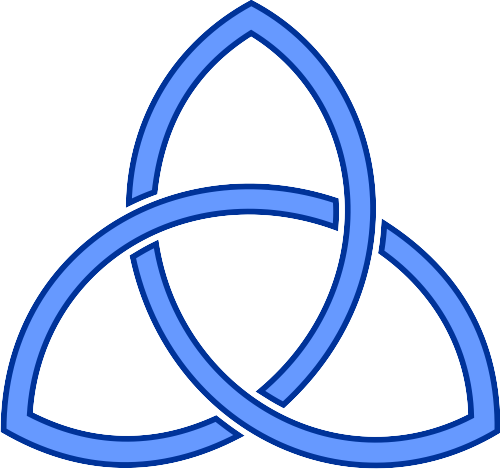 And as we breathe with both of these lungs, we will be reminded that the Trinity, the persons beyond personality who are a single God yet three persons, is bigger than any of our doctrinal statements (no matter how true those statements are). And so we will seek Him out in prayer and contemplation, questing after the Uncreated Light, the Beatific Vision, the grace of a meeting with God that is theosis. But as long as we begin in a position of hostility, our ability to love each other will be hampered. And if we cannot love our brethren whom we can see, how can we love God whom we cannot see? The imperial Adventus was a big deal, and people knew what to do when the emperor came to town. It was the sort of event that people would remember for years, and use as a peg to mark other events. It was especially important in Rome, the imperial city, the mother of Empire. There, after arriving, he would meet the Senate, give a speech to the crowd, distribute largesse. He would also hear speeches. The speechmaking was a way to negotiate the emperor’s relationship with the City (or a city) and its leading men. He would then spend some time sightseeing, and move into his quarters on the Palatine. 4. So soon, then, to pass over what was dispursed in preparation, <on 28th April> in the second Prefecture of Orfitus he passed through Ocriculi, elated with his great honours and escorted by formidable troops; he was conducted as if in battle array and everyone’s eyes were riveted upon him with fixed gaze. 5. And when he was nearing the city, as he beheld with calm countenance the dutiful attendance of the senate and the august likenesses of their patrician ancestry, he thought, not like Cineas, the famous envoy of Pyrrhus, that a throng of kings was assembled together, but that the sanctuary of the whole world was present before him. 6. And when he turned from them to the populace, he was amazed to see in what crowds men of every type had flocked from all quarters to Rome. And as if he were planning to overawe the Euphrates or the Rhine with a show of arms, while the standards preceded him on each side, he himself sat alone upon a golden chariot in the resplendent blaze of shimmering precious stones, whose mingled glitter seemed to form a sort of shifting light. 7. And behind the manifold others that preceded him he was surrounded by dragons, woven out of purple thread and bound to the golden and jewelled tops of spears, with wide mouths open to the breeze and hence hissing as if roused by anger, and leaving their tails winding in the wind. 8. And there marched on either side twin lines of infantrymen with shields and crests gleaming with glittering rays, clad in shining mail; and scattered among them were the full-armoured cavalry (whom they call clibanarii), all masked, furnished with protecting breastplates and girt with iron belts, so that you might have supposed them statues polished by the hand of Praxiteles, not men. Thin circles of iron plates, fitted to the curves of their bodies, completely covered their limbs; so that whichever way they had to move their limbs, their garment fitted, so skilfully were the joinings made. 5. Accordingly, being saluted as Augustus with favouring shouts, while hills and shores thundered out the roar, he never stirred, but showed himself as calm and imperturbable as he was commonly seen in his provinces. 10. For he both stooped low when passing through lofty gates, and as if his neck were in a vice, he kept the gaze of his eyes straight ahead, and turned his face neither to right nor to left, but, like a figurine of a man, neither did he nod when the wheel jolted nor was he ever seen to spit, or to wipe or rub his face or nose, or move his hands about. 11. And although this was affectation on his part, yet these and various other features of his more intimate life were tokens of no slight endurance, granted to him alone, as was given to be understood. 12. Furthermore, that during the entire period of his reign he neither took up anyone to sit beside him in his chariot, nor admitted any private person to be his colleague in the insignia of the consulship, as other anointed princes did, and many like habits which in his pride of lofty conceit he observed as though they were most just laws, I pass by, remembering that I set them down when they occurred. 6. So then he entered Rome, the home of empire and of all virtues (imperii uirtutumque omnium larem), and when he had come to the Rostra, the most renowned forum of ancient dominion, he stood amazed; and on every side on which his eyes rested he was dazzled by the array of marvellous sights. He addressed the nobles in the senate-house and the populace from the tribunal, and being welcomed to the palace with manifold attentions, he enjoyed a longed-for pleasure; and on several occasions, when holding equestrian games, he took delight in the sallies of the commons, who were neither presumptuous nor heedless of their old-time freedom, while he himself also respectfully observed the due mean. 14. For he did not (as in the case of other cities) permit the contests to be terminated at his own discretion but left them (as the custom is) to various chances. Then, as he surveyed the sections of the city and its suburbs, lying within the summits of the seven hills, along their slopes, or on level ground, he thought that whatever first met his gaze towered above all the rest: the sanctuaries of Tarpeian Jove so far surpassing as things divine excel those of earth; the baths built up to the measure of provinces; the huge bulk of the amphitheatre, strengthened by its framework of Tiburtine stone, to whose top human eyesight barely ascends; the Pantheon like a rounded city-district, vaulted over in lofty beauty; and the exalted peaks which rise with platforms which can be climbed, bearing the likenesses of former emperors; the temple of the City, the Forum of Peace, the theatre of Pompey, the Odeum, the Stadium and amongst these the other glories of the eternal city. It is, of course, a contrast to the Nativity of Christ. ‘Once in royal David’s city / stood a lowly cattle shed / where a mother laid her baby / in a manger for his bed’; and, further, ‘with the poor and weak and lowly / lived on earth our Saviour holy’. 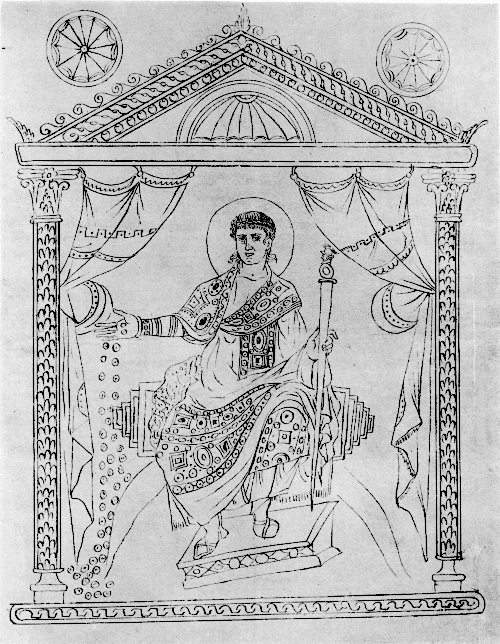 However, he did have the chorus of the heavenly army, as Constantius had his earthly army in glittering array. And I saw heaven opened, and behold a white horse; and he that sat upon him was called Faithful and True, and in righteousness he doth judge and make war. 12 His eyes were as a flame of fire, and on his head were many crowns; and he had a name written, that no man knew, but he himself. 13 And he was clothed with a vesture dipped in blood: and his name is called The Word of God. 14 And the armies which were in heaven followed him upon white horses, clothed in fine linen, white and clean. 15 And out of his mouth goeth a sharp sword, that with it he should smite the nations: and he shall rule them with a rod of iron: and he treadeth the winepress of the fierceness and wrath of Almighty God. 17 And I saw an angel standing in the sun; and he cried with a loud voice, saying to all the fowls that fly in the midst of heaven, Come and gather yourselves together unto the supper of the great God; 18 That ye may eat the flesh of kings, and the flesh of captains, and the flesh of mighty men, and the flesh of horses, and of them that sit on them, and the flesh of all men, both free and bond, both small and great. Not the happiest image Christianity has to offer — but what it does remind us is that justice will be served. And, as Miroslav Volf argues in Exclusion and Embrace, Revelation’s Rider on the White Horse means that we do not need to execute judgement here, for judgement will be rendered in the fulfillment of all things, by the returning King. Just a few Late Antique thoughts as we begin this Advent(us) season. This Sunday, December 1, will be the start of a new church year. If you go to a church with liturgical taste, deep, rich, purple hangings and stoles and chasubles and candles will appear. If not, they’ll be royal blue, unless your church doesn’t do the liturgical year at all. In which case, it will simply be another Sunday. Advent is the start of the church year! This past Sunday was Christ the King Sunday. This coming Sunday, we will go back to the beginning of it all and remember what it must have been like to await the promised Messiah as we ourselves look forward to his coming again. Here are some ideas for helping get into the spirit of things. Make an Advent/winter playlist. I’ve done this to help stave off the swiftly encroaching Christmas songs. Put on as many Advent hymns as you can find — ‘O Come, O Come, Emmanuel’, ‘Come, Thou Long-Expected Jesus’, and so forth — and add a few winter songs as well (this is part of helping form a barrier between yourself and Christmas, helping with the idea of expectation) — ‘Winter Wonderland’, ‘Sleigh Ride’ and so forth. Make an Advent wreath. 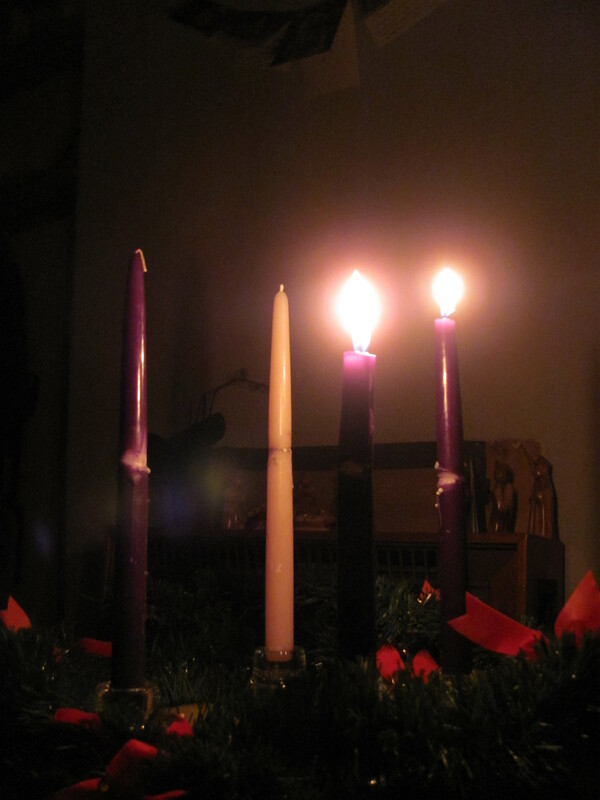 My wife and I have an Advent wreath, with three purple candles and one pink candle, a white one in the centre. Each night we light the candles, work through a little liturgy I’ve prepared, do a reading from somewhere in the Great Tradition alongside the Scriptures, and sing a hymn. This is our favourite Advent tradition, one neither of us grew up with but which helps add to the joy and splendour of this season, especially as the Scottish nights are so very long and so very dark. Find some sort of devotional tied to the church year. This year I’ll be working through the Ancient Christian Devotional for Year A (the liturgical year by the Revised Common Lectionary), by Cindy Crosby and published by IVP. Each week includes a couple of ancient (or Early Mediaeval; the Gelasian Sacramentary features largely) prayers as well as readings from the Fathers on the lectionary readings for Old Testament, Gospel, and Epistle. Alternatively, there’s the Mosaic Holy Bible. I own this and think it is fantastic. It follows the church year but not the Revised Common Lectionary. Each week has a piece of art from throughout Christian history and geography as well as prayers, poems, short readings, and longer readings from Christians throughout time and space, ranging from the Fathers to John Paul II, from Europe to South America. It is great way for people who are interested in the big sweep of the Christian faith to enter the tradition via the evangelical route. Read an Advent or Incarnation-themed book. I have read St Athanasius’ On the Incarnation twice for Advent, now. I know of people who really enjoy reading St Augustine of Hippo’s Advent sermons. Doing this is a great preparation for Christmas because it helps get you into the depth of the theological moment that is the Word of God taking on flesh and pitching his tent among us. My final talk on Ancient Christianity in Cyprus was ‘The Bible in the Ancient Church.’ Most of what I had to say I have said here before. I discussed allegory and typology, bringing up Melito of Sardis and Ephraim the Syrian. I also discussed the literal meaning of Scripture, and read out a passage from John Chrysostom’s commentary on Romans. But what was new territory for me, really, was to discuss humility before Scripture and Christocentric interpretation. What do the ancients say about humility? Another story out of Egypt tells of a group of believers discussing a passage of Scripture. Everyone gave his own interpretation, speaking his opinion and mind as it came to him. The eldest believer there remained silent, however. One of the others said to him, ‘What about you? What do you think?’ He replied that he did not know, for he was not wise enough to discern the meanings of the Holy Scriptures. I do not know that we should be so humble as that, but I do think the idea of approaching the Bible with humility is important. When we look at our many fractured denominations, not just between Protestant, Catholic, and various Eastern churches, but within evangelical Protestantism, each claiming that it has the one, true interpretation of Scripture, we should realise that perhaps some humility is in order. As far as Athanasios is concerned, the whole point of Scripture is to point towards Christ, either as shadow, type, prophecy in the Old Testament or as fulfilment, proclamation, expectation in the New. This is the general paradigm for reading Scripture. So we read Irenaios of Lyons, a man born in Izmir, writing in the late 100s about Christ as the second Adam and then going so far as to make parallels between Eve and Mary; he argues that just as sin entered through the disobedience of one woman, so did redemption begin through the obedience of another. When we read this, we don’t have to agree with him. But I, for one, applaud his desire to apply the Old Testament to the Gospel. 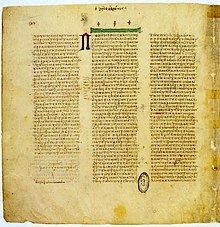 If the Bible does not have supernatural significance, if the events of the Old Testament, the bloody, violent purging of the Promised Land and the bloody, violent worship in the Tabernacle, hold only historical value about the beliefs of the people of Israel, I have no business with the Old Testament; I would rather read Homer or Vergil. But if they are part of something bigger, part of the grand narrative of God’s cosmic outworking of redemption and salvation for all of humankind, from Adam to Christ’s Second Coming, and if I can see Christ’s fulfilment of all things in the Old Testament—that’s a Scripture worth knowing. Furthermore, it’s an approach to the Old Testament that is approved by the New: Christ is the Passover Lamb, Matthew references Christ fulfilling OT prophecies, Christ refers to himself fulfilling statements in the Psalms, Paul refers to an allegorical or typological meaning of Hagar and Sarah, Hebrews sees the Tabernacle and Temple worship as shadows and figures of what has come in Christ, 1 Peter sees Noah’s Ark as a prefigurement of baptism. These are the ones that sprang to mind immediately while writing my first draft. There are no doubt more. With this attitude and this nexus of thinking in hand, I think we can come up with better exegesis and better preaching and deeper ethics than we often do. And maybe we’ll even smooth over some disputes. The Sayings of the Desert Fathers, trans. B. Ward. Kalamazoo: 1975, Antony 7. See also Abraham of Nathpar, On Prayer 3, in Brock, The Syriac Fathers on Prayer. Kalamazoo: 1987, 193; Martyrius (Sahdona), The Book of Perfection, ‘On the Office,’ 10, in Brock 1987, 206. Last Saturday morning, with the able help of a volunteer from the Greek Evangelical Church, I gave a seminar on ‘Evangelicals and Tradition.’ What I hope from this seminar is for evangelicals to be less … wary? afraid? of tradition but to develop the necessary skills of discernment to judge which parts of it are good, which are bad, and which are … adiaphora. Marginal. Not worth fussing over every time you meet an Orthodox or Roman Catholic Christian. When each of them to be baptized has gone down into the water, the one baptizing shall lay hands on each of them, asking, “Do you believe in God the Father Almighty?” 13And the one being baptized shall answer, “I believe.” 14He shall then baptize each of them once, laying his hand upon each of their heads. 15Then he shall ask, “Do you believe in Jesus Christ, the Son of God, who was born of the Holy Spirit and the Virgin Mary, who was crucified under Pontius Pilate, and died, and rose on the third day living from the dead, and ascended into heaven, and sat down at the right hand of the Father, the one coming to judge the living and the dead?” 16When each has answered, “I believe,” he shall baptize a second time. This led to a fruitful, I believe, discussion of how similar Hippolytos’ baptismal ceremony is the Orthodox ceremony — triple immersion and anointing with oil! I said that the Orthodox got this from the ancient days; it is a tradition that they have maintained since the earliest days of the Church. Perhaps one evangelical-Orthodox wall was weakened by that realisation. From there, I brought forth the Nicene and Constantinopolitan Creeds of 325 and 381. The complaint could be made that the statements of 325 and 381 use non-biblical language, and that the Bible already teaches all of these things. However, as with Irenaios vs Gnostics who used Christian Scripture, so also in the battle against those who denied the divinity of Jesus. The argument was not over what was Scripture but how we understand it; so the Church came up with an interpretative lens, almost as old as the apostles themselves, drawn from Scriptural ideas and truths but using the language of Greek philosophy, to state unequivocally what the Scriptural and Traditional teachings about Jesus are. Another complaint I know of is that encapsulating the Gospel in such statements takes the life from it. This is a possibility—but it is a possibility even with the writings of Scripture, depending on how we use them. I prefer to view these statements of the centre of Christian tradition as fences or the boundaries of a playing field. We can say things they do not say, but if we say things that are counter to them, we find ourselves standing outside of the biblical, apostolic tradition that the Church has handed down to us as encapsulated in these creeds. The purpose of all of this was to show how unchanging the central core of Christian tradition was throughout the ancient church, and how it is important for us today. 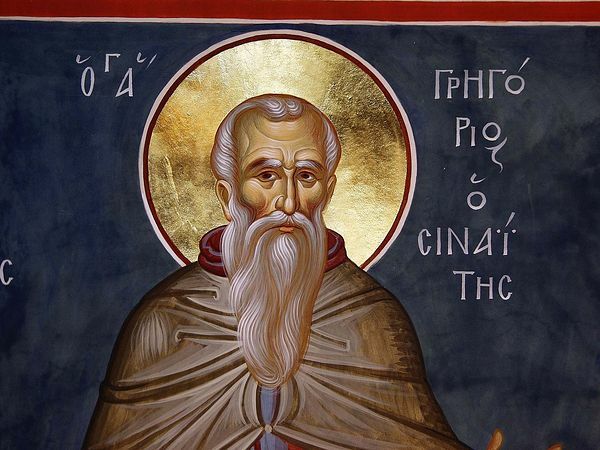 Furthermore, when we go back to Irenaios, we see the importance of a central, unwritten Apostolic tradition that exists in tandem with the Scriptures, because the Gnostics, using the same Scriptures, claimed that their interpretation was the right one, and their unwritten tradition the true one. So what are we to do? Recourse to the Scriptures alone cannot save us when they, too, are using the Scriptures. When most evangelicals think of tradition, we think of these ‘unwritten’ aspects of Christianity, we think of accretions adding up over time, we think of bishops, priests, and deacons, we think of saints and theologians, we think of stained glass, of Gothic architecture and Byzantine domes. In a very large, encompassing vision of tradition, these things are all part of tradition. But what I hope to have shown here today is a core of tradition that remains very little modified over the centuries—that creed of 381 just discussed and on your handout is believed and affirmed by Roman Catholics, Eastern Orthodox, Coptic, Armenian, Ethiopian, and Syrian Orthodox, the Church of the East from Iran to China and India, Anglicans, Lutherans, Methodists, Presbyterians, the Dutch Christian Reformed, and the Nicosia International Church. Here is an aspect of tradition that we affirm today which was affirmed long ago by the Christians of the later Roman Empire. If we want to get involved with ancient Christians, we must take the long view of Christian history. And in taking this long view, the question that arises is whether any given development is faithful to Gospel belief and Gospel living—to the Tradition as discussed above and enshrined in the Bible, as we’ll see in my next talk. 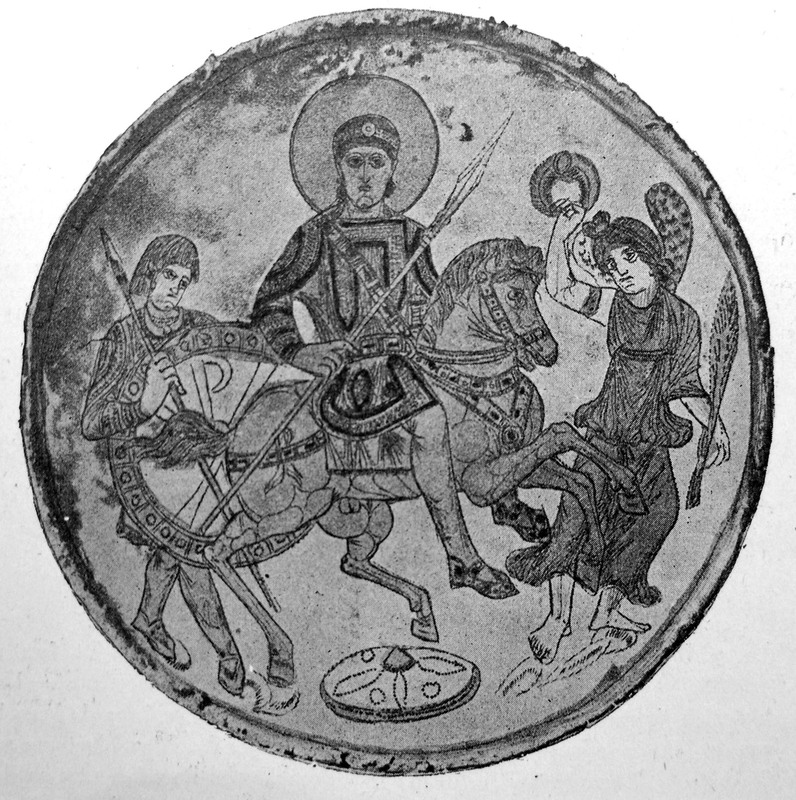 The Christians before the year 500 determined that Gnosticism, Monarchianism, Arianism in its various forms, Pneumatomachianism, Pelagianism, Nestorianism, Manichaeism, Eutychianism, certain strains of Origen’s thought, and many others were deviations from the truth handed down from the apostles, the paradosis, tradition in its truest sense. And we today owe much to this ancient tradition.